Presswerk is a veritable playground of analogue-style compression, with a fabulous sound and insane attention to detail. Sounds fantastic. Unusual but welcome flexibility. Easy one-screen layout. Excellent vintage emulation presets. Reasonably CPU-efficient. Not for compression novices. Would benefit from more vintage presets. 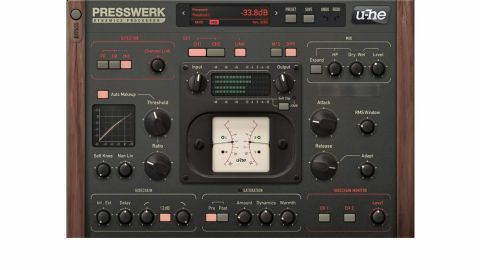 Presswerk is a brand new dynamics processing plugin (VST/AU) from the very highly regarded u-he, combining compression and saturation in a single, visually appealing interface. u-he claims that its sound is heavily influenced by a number of classic hardware compressors (none of which are named), and that their primary development goal was to make it as 'analogue' sounding as possible. On the face of it, Presswerk appears to be reasonably simple, with the main Compressor section, which dominates the interface, either preceded or followed (as set using the Pre/Post buttons) by the three-knob Saturation section at the bottom (Amount, Dynamics and Warmth). "Boasting deeply impressive flexibility and a stellar sound, this is a dazzling dynamics processor"
The compressor sports controls for Threshold (0 to -60dB), Ratio (up to 20:1), an Attack/ Release envelope, Soft Knee adjustment and Auto Makeup. There's also mid/side operation as well as conventional stereo and independent left/right processing (in both cases, channels are labelled CH1 and CH2). The centre section houses Input and Output gain controls (up to +/-40dB and +/-30dB respectively), plus LED level and VU gain reduction meters (with metered gain reduction taking compression and saturation into account). Interface settings include window rescaling and brightness, while the top Control Bar gives access to the Preset browser and incorporates the Data Display, which indicates the selected Preset and parameter value changes. In fact, this is the only way to see parameter values at all, as the knobs themselves are totally bereft of scales or indicators. Also in the Data Display is a button for activating 4x oversampling (HQ). Presswerk also includes a number of 'deeper' controls for finessing particular aspects of the compression process that you rarely get access to in other plugins. Detection affects where the key signal is sourced from and includes both the traditional Feedback mode and the more contemporary Feedforward. There's also a programme-dependent Interactive option, which favours feedforward for transient-rich audio and feedback the rest of the time. For all modes, full control is given over the detector L/R channel linking (0-100%). In addition to high- and low-cut filters with a choice of 6dB and 12dB/octave slope, Presswerk's Sidechain section features a mix control for blending between the internal sidechain and an external one, and a Delay option offering both delay and advance (lookahead, in other words) of the sidechain signal by up to 5ms in either direction, for precise control of the attack stage. Moving on to the Attack/Release envelope, you get full control of input sensing via the RMS Window parameter (from true peak response at 0.1ms to opto-style lag at 10-30ms) and some control of the auto-release behaviour via Adapt, which sets the length of the auto-release analysis window. Finally, the output Mix section provides extensive configuration of parallel processing, with wet Level, Dry/Wet mix, fully adjustable high-pass filter (1Hz-20kHz) and a dry signal Expander mode. The expander derives its behaviour from the gain reduction and ratio set in the main compressor section, acting like a gate when both are at high settings. A quick flick through Presswerk's presets not only reveals the identities of many of the devices that inspired it (Urei 1176, dbx 160, SSL 4000 Bus Compressor and Channel, etc) but also demonstrates the flexible controls in action. Witness, for example, the high Non Linearity gain reduction setting of '1176 Smash' (an 1176 all-buttons-in emulation), and the Feedback detection with adjusted Sidechain Delay for '670 T1' (similar to the Fairchild 670's Time Constant 1 setting). In fact, all the presets in the Vintage folder are superb - particularly the dbx 160 and SSL 4000 channel - and our enjoyment of them was tempered only by the fact that we wanted more than the 15 supplied. Elsewhere among the presets, you'll find Presswerk's parameters pushed in all directions to assist in the creation of snappy snares, punchy kicks, gentle mix bus compression and solid submixes. Many of the presets take advantage of the highly flexible Mix section, blending in the dry signal for parallel compression and employing the Expander to great effect. So, how about that Saturation section? For the most part this works very well, providing subtle flavour (which is how many of the presets employ it). The Warmth control is a bit like a tilt EQ, favouring high frequencies (and curtailing lows) as you wind it up. Higher Amount settings provide another option for taming transients, adding the obligatory odd harmonics for tape saturation-style flavours. Increasing the Dynamics control makes the Saturation more responsive to gain reduction levels in the compressor circuit, and the whole plugin comes together very effectively. Nonetheless, the saturation aspect is very much overshadowed by the headlining compressor elements. u-he have clearly designed Presswerk to deliver as wide a range of classic analogue flavours as possible, but in the process they've also laid bare and given access to many of the parametric subtleties that contribute to some of history's most beloved hardware units. Boasting deeply impressive flexibility and a stellar sound, this is a dazzling dynamics processor that no producer or engineer could fail to fall in love with.